Top Animation News is a weekly column that rounds up the biggest, best and breaking stories from the animation industry. This edition covers March 8 to 15, 2019. 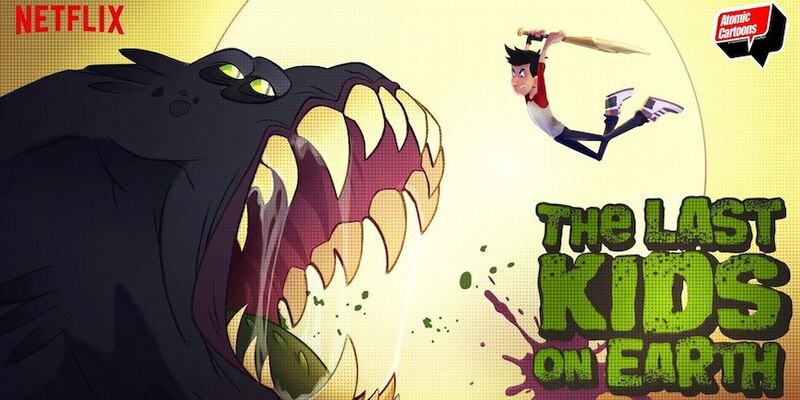 Atomic Cartoons has announced the voice cast for its upcoming Netflix animated series The Last Kids on Earth, including Mark Hamill, Rosario Dawson, Catherine O’Hara, Keith David, Bruce Campbell, Garland Whitt, Montse Hernandez and Charles Demers, with Nick Wolfhard as lead character Jack Sullivan. The toon is based on Penguin Random House’s book franchise of the same name and follows a group of suburban tweens who live in a treehouse, eat candy, play videos and fight zombies in a post-monster-apocalyptic world. The Last Kids on Earth is produced in Toon Boom Storyboard Pro and Toon Boom Harmony animation software. Read more about The Last Kids on Earth on “Animation Magazine”. This week, Netflix announced a trio of anime production company partnerships: Anima for Altered Carbon: Resleeved, an animated spinoff of the live-action Altered Carbon series; Dragon’s Dogma from Sublimation, based on the Capcom role-playing game of the same name; and David Production will do SPRIGGAN, based on the manga by Hiroshi Takashige. The American streaming giant also added Gods & Heroes to its roster, created by Charley and Vlas Parlapanides and Powerhouse Animation (the studio behind Castlevania). The new anime series will be based on Greek mythology. For more on Netflix’s trio of anime partnerships, visit “Variety” and get all your Gods & Heroes info on “The Hollywood Reporter”. The first series from Irish production company Lighthouse Studios, The Bug Diaries, released its trailer this week. Produced in Toon Boom Storyboard Pro and Harmony animation software for Amazon Prime Video Kids, the children’s cartoon is based on the best-selling books of the same name and follows bug buddies Worm, Fly and Spider. Lighthouse Studios specializes in 2D productions and was formed by a partnership between Ireland’s Cartoon Saloon and Canada’s Mercury Filmworks. Watch The Bug Diaries trailer above or on Amazon Prime Video Kids' YouTube. In an animated segment on Full Frontal with Samantha Bee (produced by an entirely female crew), storyboard artists Megan Nicole Dong and Ashlyn Anstee, storyboard director Katie Rice and art director Paula Spence reflected on how their experiences in a private Facebook group for women animators led to the firing of Loud House creator Chris Savino following multiple sexual-harassment allegations. While the group was unable to pursue legal action against him due to California’s statute of limitations, they were able to get the word out to the industry about what he had done via “Cartoon Brew”. Spoiler: this led to The Animation Guild suspending Savino following a public hearing on his conduct. Find the full synopsis on “Vulture” or just watch the animated segment above. Even more Top Animation News below! Artist Tony Grillo produced the animated trailer for the upcoming children’s book, Little Taco Truck, in Toon Boom Harmony. Impressively, the software amplified his skills so that he could do it independently, on a shoestring budget and in just three weeks. To illustrate how he brought the Little Taco Truck trailer to life, he created three free tutorials for working with bitmap assets in Toon Boom Harmony. Check out the first Little Taco Truck Harmony tutorials above and read more on the Toon Boom blog. Considering its relatively small population, Canada is blessed with numerous animation hubs including Ottawa, Montreal and Vancouver, with the latter’s industry projected to bring in over $1 billion for the first time ever in 2019. The value of its toon and VFX market has more-than tripled since 2012, when it was worth $324 million. Among Vancouver’s top recent productions are Oscar-winning feature Spider-Man: Into the Spider-Verse and celebrated series Bob’s Burgers and Rick and Morty (both created in Toon Boom animation software). Dig into the size of Vancouver’s animation industry more on “Daily Hive”. As reliable anime destinations for US viewers, it makes sense that Adult Swim and Crunchyroll are partnering to become one of the biggest distributors of Japanese animation stateside — particularly in the face of growing competition from Netflix. The pair reach 94 million households and 47 million users respectively and now share the same parent company: WarnerMedia. For viewers, this means more Crunchyroll-licensed programs and original series on Adult Swim including the upcoming anime Blade Runner spinoff, Black Runner — Black Lotus. Toon into the Adult Swim x Crunchyroll anime partnership details on “Polygon”. Adult Swim will be launching its latest animated comedy Lazur Wulf on April 7 at midnight. The quarter-hour series is created by Henry Bonsu and produced by Bento Box Entertainment in Toon Boom Harmony. Lazur Wulf follows a wolf with a laser on his back as he hangs out with his fellow carefree creatures around the neighbourhood; its voice cast includes hip-hop artists Vince Staples and DRAM, the WWE’s Big E, Quinta Brunson, Judnick Mayard, Andre Pascoe, Reginald VelJohnson and J.D. Witherspoon. Catch the Lazur Wulf trailer above and read more about it on “Animation Magazine”. While language barriers and funding challenges have historically held Japanese production companies from going global, a rising generation of creators is seeking international collaborators. Fukuoka-based MontBlanc is one of the first homegrown studios to work with a foreign co-producer; it has partnered with France’s Animalps Productions on an upcoming toon based on the Nippon book series Chad & Clark and is hoping to tap into the European country’s lucrative tax credits. As Japan’s industry hits a crossroads, with anime popularity stagnating at home but booming overseas, practices like this may not only become more common but be a necessity. Investigate the future of Japan’s animation industry on “Kidscreen”. Spotlight Stories, Google’s in-house film studio tasked with producing 360-degree videos for phones, has shut its doors after six years. During that time, it released an impressive 13 pieces including tie-ins for The Simpsons and Wes Anderson’s Isle of Dogs as well as original content like Aardman Animation’s Pearl, which became the first-ever VR film nominated for an Oscar in 2017. Google has not given a reason for Spotlight Stories’ closure. Search for all the Google Spotlight Stories details on “The Verge”.